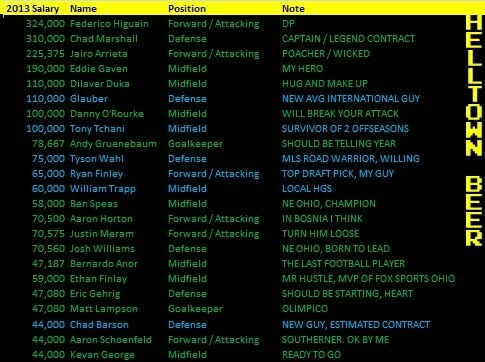 Here is an updated summary on the Crew roster as far as I can figure going into this weekend. Salary to cap includes my own estimates on wage increases over last year. Overall, I'm including a 8.6% pay increase from players with contracts carrying over to the Crew. 9 : Players "on Trial"
I'm pretty sure that most the trialists have a strong shot of getting signed due to small roster size. Brettschneider would be a good get for the Crew and I'm basically calling Beckie signed. Columbus has a mountain for salary cap space. Matias Sanchez is rumored to be heading to Columbus but is as of yet confirmed. I would not expect Sanchez to be a Designated player but would expect his salary to be at Mirosevic levels (200-250k). In my roster image. Guys in blue are estimated. Not in blue but given a raise is Josh Williams. I suspect with him being pegged for a starting role he will make starting salary (65-100k for US born MLS players). Keep an eye on Massive Report. I'll start posting this roster stuff there once the team takes better shape in the next couple weeks.